Evolve Fitness - It’s never too late to begin a workout program! 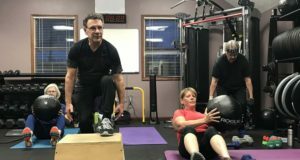 Evolve Fitness - It’s never too late to begin a workout program! Evolve Fitness was started with one goal in mind. Get people moving! Our mission is to change lives using the power of physical fitness and nutrition. 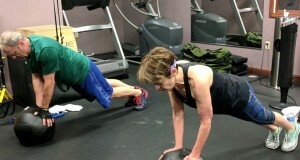 Personal Training utilizing TRX, Bosu, lightweights and core stabilization exercises. Boot Camps and small group classes offer a team atmosphere for all levels. Evolve trainers maintain credentials by attending seminars and constantly researching to stay on top of a changing fitness industry. We encourage everyone in taking the first step to set up a consultation and start a change today! I am now able to lift my 30lb. grandaughter! Since starting the strength training classes with Shawn, I am so proud of my accomplishments! I am now able to lift my 30lb. Granddaughter. I can do 20 push ups on my knees and much more. I highly recommend Shawn, he is GREAT! I am 73 years old and my goal is to continue to grow stronger.